Google’s new responsibility towards privacy? So, what could Google do to demonstrate that it still takes on-line security seriously? 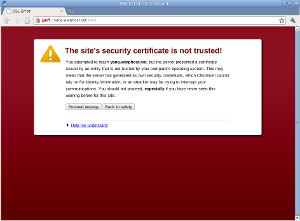 How about setting up its own Certificate Authority, and issuing free SSL certificates? Google has the infrastructure, manpower and, I’d argue, interest in doing such a thing. In fact, in many ways, it already offers the flesh around this missing skeleton. Perhaps it could support the CACert effort with funding and enough energy to get it through the audits required to have their root certificate included in Mozilla’s Firefox, as-shipped? And, while Google are at it (restoring their image of benevolence, that is), they could include that root certificate in Chrome too. I confess: this is a problem without an obvious solution. As a server administrator managing tens, possibly hundreds, of domains via Parallels’ Plesk control panel system, you may be forgiven for getting frustrated, from time to time. It happens. While Plesk is a big time-saver for many tasks, there are occasional quirks which only help to irritate. One of these being SSL certificates. The Plesk control panel comes with a standard SSL certificate which is used to encrypt all HTTPS connections to/from the server by default. Most server administrators will probably want to replace this with a certificate that correctly identifies their specific server. The usual route, through Plesk 9.5.x would be to log in, click Settings, click SSL Certificates, and then create / delete certificates accordingly until you have a new default server certificate. The final step would be to tick the checkbox next to the new default certificate and click “Secure Control Panel”. This gives you the impression that the new certificate is now used by the control panel. It isn’t. "Hmm", you think, "this should have been updated when I 'Secured the Control Panel'". Yes, it should. So, the next logical step would be to edit httpd.pem and replace the Key and Certificate values of this file with those displayed through Plesk's SSL Certificates section. Then simply restart the web server. Ha ha! Fail! Browsing to the control panel still results in the security warning. What gives?!! After you have restarted the web server many times, both via the operating system's /etc/init.d method and via /usr/local/psa/admin/bin/websrvmng, you conclude that, actually, this is also not the certificate that requires updating. So, which certificate file stored on the system is the one being served by Plesk? Good question. While you're searching for an answer, try checking/editing /usr/local/psa/admin/conf/httpsd.pem  and  /usr/local/psa/etc/httpsd.pem. Nope?